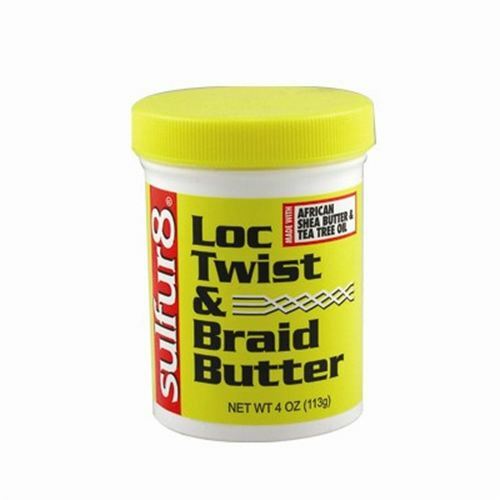 Sulfur 8 Lock Twist and Braid Butter 4oz made with african shea butter & tea tree oil Sulfur 8 Loc Twist & Braid Butter is great for styling and maintaining your locs, twists and braids. Softens, conditions and adds shine to dull hair. Great for natural hair and extensions. Directions: Shampoo hair. Lightly towel dry. Apply with fingertips in small sections to hair. Style as desired. Use SUlfur 8 Loc Twist & Braid Oil to moisturize hair and scalp. INGREDIENTS: PETROLATUM, PARAFFIN, MINERAL OIL (PARAFFINUM LIQUIDUM), OZOKERITE, BEEWAX (CERA ALBA), BUTYROSPERMUM PARKII (SHEA BUTTER), SORBITAN TRIOLEATE, CETYL ALCPHOL, PRUNUS AMYGDALUS DULCIS (SWEET ALMOND) OIL, FRAGRANCE (PARFUM), MELALEUCA ALTERNIFOLIA (TEA TREE) LEAF OIL, PHENYL TRIMETHICONE.